On the 23rd March 2010, UCL hosted the second workshop on usability of geographic information, organised by Jenny Harding (Ordnance Survey Research), Sarah Sharples (Nottingham), and myself. This workshop was extending the range of topics that we have covered in the first one, on which we have reported during the AGI conference last year. This time, we had about 20 participants and it was an excellent day, covering a wide range of topics – from a presentation by Martin Maguire (Loughborough) on the visualisation and communication of Climate Change data, to Johannes Schlüter (Münster) discussion on the use of XO computers with schoolchildren, to a talk by Richard Treves (Southampton) on the impact of Google Earth tours on learning. Especially interesting are the combination of sound and other senses in the work on Nick Bearman (UEA) and Paul Kelly (Queens University, Belfast). Jenny’s introduction highlighted the different aspects of GI usability, from those that are specific to data to issues with application interfaces. The integration of data with software that creates the user experience in GIS was discussed throughout the day, and it is one of the reasons that the issue of the usability of the information itself is important in this field. The Ordnance Survey is currently running a project to explore how they can integrate usability into the design of their products – Michael Brown’s presentation discusses the development of a survey as part of this project. The integration of data and application was also central to Philip Robinson (GE Energy) presentation on the use of GI by utility field workers. My presentation focused on some preliminary thoughts that are based on the analysis of OpenStreetMap and Google Map communities response to the earthquake in Haiti at the beginning of 2010. The presentation discussed a set of issues that, if explored, will provide insights that are relevant beyond the specific case and that can illuminate issues that are relevant to daily production and use of geographic information. For example, the very basic metadata that was provided on portals such as GeoCommons and what users can do to evaluate fitness for use of a specific data set (See also Barbara Poore’s (USGS) discussion on the metadata crisis). Interestingly, the day after giving this presentation I had a chance to discuss GI usability with Map Action volunteers who gave a presentation in GEO-10 . Their presentation filled in some gaps, but also reinforced the value of researching GI usability for emergency situations. For a detailed description of the workshop and abstracts – see this site. All the presentations from the conference are available on SlideShare and my presentation is below. After the publication of the comparison of OpenStreetMap and Google Map Maker coverage of Haiti, Nicolas Chavent from the Humanitarian OpenStreetMap Team contacted me and turned my attention to the UN Stabilization Mission in Haiti’s (known as MINUSTAH) geographical dataset, which is seen as the core set for the post earthquake humanitarian effort, and therefore a comparison with this dataset might be helpful, too. The comparison of the two Volunteered Geographical Information (VGI) datasets of OpenStreetMap and Google Map Maker with this core dataset also exposed an aspect of the usability of geographical information in emergency situations that is worth commenting on. For the purpose of the comparison, I downloaded two datasets from GeoCommons – the detailed maps of Port-au-Prince and the Haiti road network. Both are reported on GeoCommons as originating from MINUSTAH. I combined them together, and then carried out the comparison. As in the previous case, the comparison focused only on the length of the roads, with the hypothesis that, if there is a significant difference in the length of the road at a given grid square, it is likely that the longer dataset is more complete. The other comparisons between established and VGI datasets give ground to this hypothesis, although caution must be applied when the differences are small. The following maps show the differences between the MINUSTAH dataset and OpenStreetMap and MINUSTAH and Google Map Maker datasets. I have also reproduced the original map that compares OpenStreetMap and Map Maker for the purpose of comparison and consistency, as well as for cartographic quality. 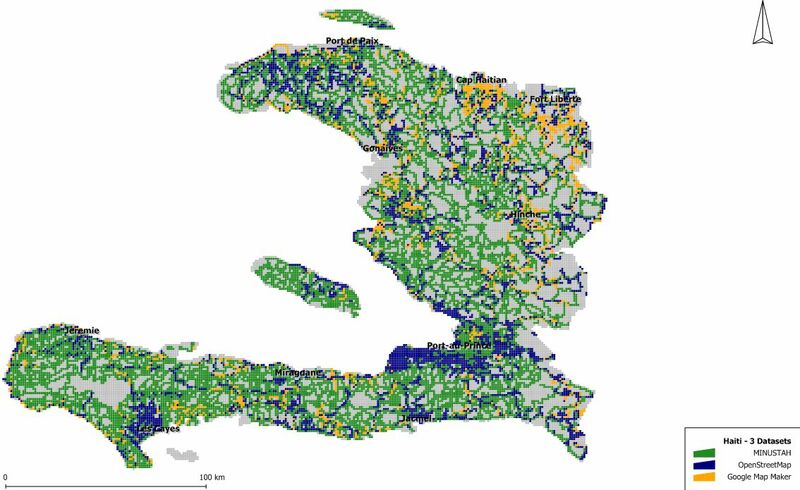 The maps show that MINUSTAH does provide fairly comprehensive coverage across Haiti (as expected) and that the volunteered efforts of OpenStreetMap and Map Maker provide further details in urban areas. There are areas that are only covered by one of the datasets, so they all have value. The final comparison uses the 3 datasets together, with the same criteria as in the previous map – the dataset with the longest length of roads is the one that is considered the most complete. It is interesting to note the south/north divide between OpenStreetMap and Google Map Maker, with Google Map Maker providing more details in the north, and OpenStreetMap in the south (closer to the earthquake epicentre). 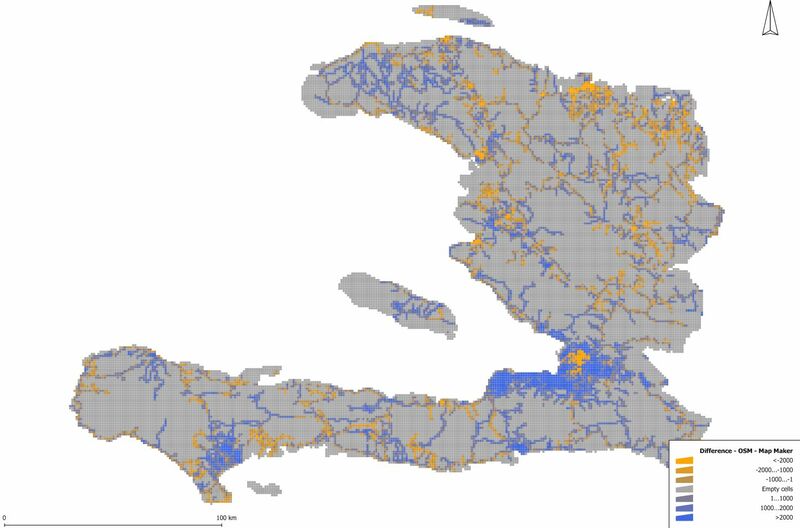 When compared over the areas in which there is at least 100 metres of coverage of MINUSTAH, OpenStreetMap is, overall, 64.4% complete, while Map Maker is 41.2% complete. Map Maker is covering further 354 square kilometres which are not covered by MINUSTAH or OpenStreetMap, and OpneStreetMap is covering further 1044 square kilometres that are missing from the other datasets, so clearly there is a benefit in integrating them. The grid that includes the analysis of the integrated datasets in shapefile format is available here, in case that it is of any use or if you like to carry out further analysis and or visualise it. 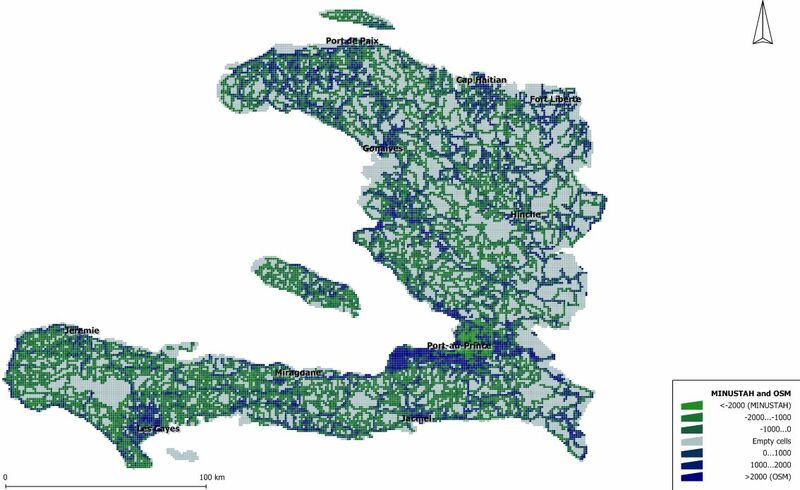 While working on this comparison, it was interesting to explore the data fields in the MINUSTAH dataset, with some of them included to provide operational information, such as road condition, length of time that it takes to travel through it, etc. These are the hallmarks of practical and operational geographical information, with details that are relevant directly to the end-users in their daily tasks. The other two datasets have been standardised for universal coverage and delivery, and this is apparent in their internal data structure. Google Map Maker schema is closer to traditional geographical information products in field names and semantics, exposing the internal engineering of the system – for example, including a country code, which is clearly meaningless in a case where you are downloading one country! OpenStreetMap (as provided by either CloudMade or GeoFabrik) keeps with the simplicity mantra and is fairly basic. Yet, the scheme is the same in Haiti as in England or any other place. So just like Google, it takes a system view of the data and its delivery. This means that, from an end-user perspective, while these VGI data sources were produced in a radically different way to traditional GI products, their delivery is similar to the way in which traditional products were delivered, burdening the user with the need to understand the semantics of the different fields before using the data. In emergency situations, this is likely to present an additional hurdle for the use of any data, as it is not enough to provide the data for download through GeoCommons, GeoFabrik or Google – it is how it is going to be used that matters. Notice that the maps tell a story in which an end-user who wants to have full coverage of Haiti has to combine three datasets, so the semantic interpretation can be an issue for such a user. So what should a user-centred design of GI for an emergency situation look like? The general answer is ‘find the core dataset that is used by the first responders, and adapt your data to this standard’. In the case of Haiti, I would suggest that the MINUSTAH dataset is a template for such a thing. It is more likely to find users of GI on the ground who are already exposed to the core dataset and familiar with it. The fields are relevant and operational and show that this is more ‘user-centred’ than the other two. Therefore, it would be beneficial for VGI providers who want to help in an emergency situation to ensure that their data comply to the local de facto standard, which is the dataset being used on the ground, and bring their schema to fit it.